Repair Yard Kits are available in a variety of sizes ranging from small and medium size vessels up to 80 feet and more. Kits are available in either manual or hydraulic versions and include all accessories to service a wide combination of propeller shaft and bearing dimensions. 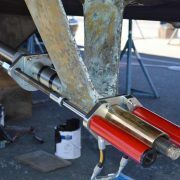 All Strut Pro manual tools can be upgraded to hydraulic at anytime. Expanded Standard Repair Yard Kit (Manual) For Up To 3-1/2″ Bearing O.D. Expanded Standard Complete Repair Yard Kit (Manual) includes all accessories for replacing up To 3-1/2″ O.D. Bearings. This kit includes the same items as our Standard Complete Repair Yard Kit but also includes 3-1/4″ and 3-1/2″ horseshoes, collets and longer threaded rods. Mega Complete Repair Yard Kit (Manual) Replaces 1-1/4″ Thru 4-1/4″ bearing o.d. Includes all components. 5 Ton Hydraulic Upgrade Conversion Kit. This kit upgrades the Strut Pro Standard (8-1/4″) Kit from manual operation to hydraulic. This kit is ideal for small to medium size vessels. 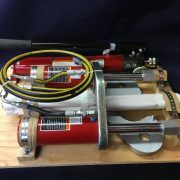 Kit includes new yokes, hydraulic hose assembly, fittings, quick disconnect, threaded rod adjustments with couplers. Pump is sold separately. This is also an ideal upgrade for wakeboard and tournament ski boat kits. Sail Boat and Small Yacht Repair Yard Kit (Hydraulic). Includes all components for replacing all bearings from the smallest through 2″ O.D. By adding additional components this kit is expandable up to 2-1/2″ shaft by 3-1/2″ bearing o.d.) Pre-assembled and tested, includes Hydraulic Cylinders & Hose Assembly. Pump Sold Separately. 5 Ton Hydraulic Standard Repair Yard Kit. Kit Includes Accessories For Up To 3″ Bearing O.D. (Expandable To 3-1/2″ O.D.) 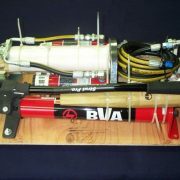 Includes 10,000 PSI Hydraulic Cylinders & Hose Assembly. Pump Sold Separately. Standard Complete Repair Yard Kit (Hydraulic) Includes Accessories Up To 3″ Bearing O.D. (Expandable To 3-1/2″ O.D.) Includes 10,000 PSI Cylinders, Hose Assembly And 10,000 PSI Pump. Complete Assembly. 5 Ton Hydraulic Expanded Standard Repair Yard Kit For Up To 3-1/2″ Bearing O.D. Replace up to 3-1/2″ bearings with this kit. 5 Ton Hydraulic Expanded Standard Repair Yard Kit includes all accessories for replacing all sizes up to 3-1/2″ O.D. bearings. This kit includes the same items as our Standard Complete Repair Yard Kit but also includes 3-1/4″ and 3-1/2″ horseshoes, collets and longer threaded rods for the longer struts. Pump sold separately. Replace up to 3-1/2″ bearings with this kit. 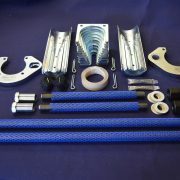 5 Ton Hydraulic Expanded Standard Repair Yard Kit includes all accessories for replacing all sizes up to 3-1/2″ O.D. bearings. 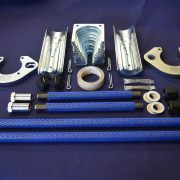 This kit includes the same items as our Standard Complete Repair Yard Kit but also includes 3-1/4″ and 3-1/2″ horseshoes, collets and longer threaded rods for the longer struts. Pump included. Complete assembly. 10 Ton Mega Hydraulic Repair Yard Kit replaces Cutless bearings on propeller shafts up to 3-1/2″ (4-1/2″ Bearing O.D.) Includes Hydraulic Cylinders and Hose Assembly. Due to larger hydraulic cylinders we recommend our P1201 Two Speed Hand Pump with 67 inch Reservoir. Pump Sold Separately.